So you’ve heard about llamas being great fox chasers? But if they are, how good are they? How do they do it? How many llamas do you need to achieve that purpose? What do they eat? How much care does a llama need? Will your fences keep them in? How long does a llama live? How much does a llama cost? How does that price equate with other fox control methods – like human fox patrol & shooting, baiting, Maremma dogs, alpacas etc? Yes, llamas are elite fox chasers. They bond with sheep, alpacas, goats, deer, and even poultry, guarding them from predators. Once they establish a paddock as “their territory” it is instinctive for them to rid their paddock of foxes. They bond with the sheep flock, which is not all that obvious until the lambs begin to drop, when the llamas become addicted to their “lamb-sitting” duties. When a llama spots danger, he makes a shrill neighing sound (the alarm call) and begins to “eye-ball” his opponent. Often this is sufficient to intimidate a fox, but if not the llama won’t hesitate to harass, chase and stomp on the fox – if the fox’s retreat isn’t fast enough. Any fox surviving a llama attack, is sure to seek a “llama free” paddock in which to find his take-away dinner! There are a multitude of stories about the incredible dedication of llamas caring for each member of their flock. Several years ago, the foxes at my Sutton property enjoyed regular chicken takeaways. Thirty chicken dinners (the fox’s dinners) later we decided that if we were ever to see an egg again, we had better do something – so we pursued a shooting regime to reduce the foxes – but the respite was short lived – new foxes moved in. Then my llamas arrived. Now I scarcely see a fox, or if I do it is in full flight pursued by the llamas. They just won’t tolerate the intrusion of a fox or unknown dog on their turf. An alpaca grower at Mudgee, reported that his neighbour was involved in the fox poisoning program. The baits were being taken in large numbers except along the boundary fence – where the baits were untouched. Closer investigation revealed that the other side of the boundary was being patrolled by alpacas. The foxes wouldn’t take baits even though there was a fence to protect them from the alpacas! A Victorian farmer reports that his alpacas cornered a fox in an electrically fenced paddock and then stomped him to death. 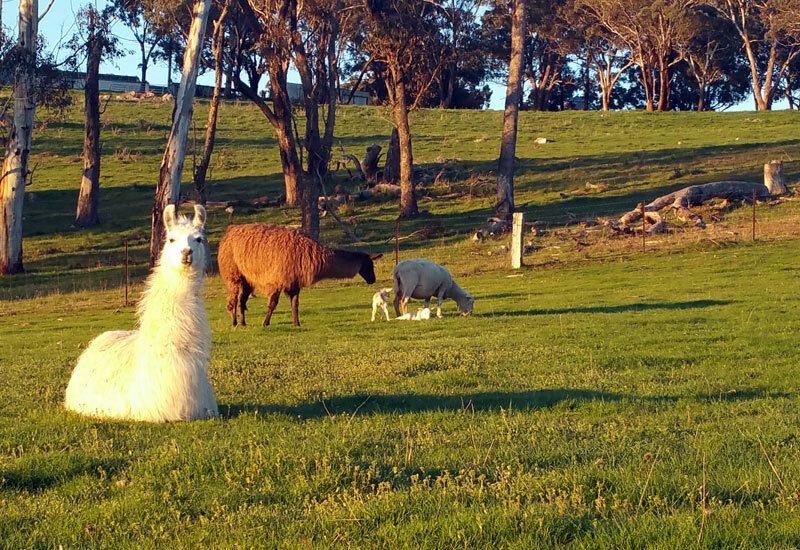 A Southern Tablelands farmer said his lamb losses to fox predation dropped to nil with the addition of 2 llamas. An alpaca-less farmer reported only 17% lamb weaning rate, but the following year with the addition of 2 alpacas for fox protection 100% weaning. A NSW Southern Tablelands sheep farmer said his lamb losses to fox predation dropped to nil with the addition of 2 llamas. I asked him how he made that assessment, and he said that twice daily he counted the lambs. He also said that a few new-born lambs died during a very cold snap, and the carcasses weren’t even touched! He had to help a ewe deliver her lamb, and said that the llamas stood nearby protesting and sometimes, when their instinct got the better of them even pushing the farmer away. Presumably, even though they knew the farmer, they were concerned that he was “attacking” the lamb. Another farmer, noticing the absence of his llama, spotted him away from the flock at the far end of the paddock. On inspection it was found that one ewe had strayed into an adjacent paddock and was unable to rejoin the flock. The llama guarded her until the farmer could help return her to the flock. Other reports of llamas guarding sick and orphaned lambs are common, and one farmer says that one day his llama was so distressed that the farmer followed the llama to the dam where several ewes were bogged in the mud. Certainly conventional farmers are understandably skeptical sceptical about such anecdotes but American studies bear out these claims. Prof. William Franklin of Iowa State University researched the benefits of guardian llamas used by145 US sheep farmers. The llamas guarded flocks between 4 to 2,100 sheep, the usual average being between 250 – 300 sheep in paddocks averaging 250 – 300 acres. Prior to the introduction of llamas the farmer’s losses to predation averaged 11% and after the introduction of llamas farmers reported 1% losses. Over 50% of these farmers said their losses had dropped to zero! Of the farmers surveyed, about 50% saw their llamas interact with potential predators – coyote, dog, fox and bear (presumably brown bear, but Koalas Beware!). A variety of responses were noted including: alarm call (32%); run at predator (62%); pursue fleeing predator (58%); kick/strike predator (21%); round up sheep and protect (34%); or position himself between predator and sheep (8%). Many llamas exhibited several of the above strategies, and some llamas killed coyotes and other predators. Franklin’s research suggests that one llama will bond better with his ovine charges than having two or more llamas. I have spoken to many people who believe two llamas are better. Obviously a llama can only be in one place at a time, and depending on the size of the lambing mob(s), the topography and the size of the paddock, more than one llama may be a better option. Once lambing is complete in one mob of ewes, llamas will readily accept responsibility for a new flock. A llama’s lifespan is around 20 – 30 years, so you can expect 24 hour a day fox surveillance 365 days a year for 20 years or so. How many lambs do you think you lose to foxes per annum? (How many more might you be losing to foxes?) What is the value of a weaning lamb? Multiply your cost of lamb losses per annum by 20 years, and you’ll have an idea of how much it costs not to have a llama guardian. There are unseen costs too, such as slower growth rates due to stress by intruders. For 20 –30 years protection, a llama costs from around $ 2,000 (ie from around $ 100 per annum) for a guardian. Pet, show or performance geldings or males as well as breeding females are of course considerably more expensive. Alpacas will also act as guardians, however their smaller stature, slower speed, heavier fleece and woolly face and small ears, makes them not as effective as the larger llama. The llama’s large ears, together with his wool-less head allow both excellent vision and hearing. His height of around 2 metres makes him an ideal fox-sighting sentry. At 160 – 200 kg, he is three or four times heavier than the alpaca thus posing a much greater threat to a fox. The more athletic llama has greater speed and stamina, which he uses to great advantage to relentlessly pursue invaders. The alpaca is a cheaper alternative, but not as effective as the llama. (In USA many alpaca farmers keep a llama to protect their alpacas from coyotes!) The llama is the elite fox chaser. Maremma guardian dogs cost around $ 500 to buy and about the same amount to maintain each year. They must be trained and handled correctly if they are to guard lambs. A Maremma who fails to do his duty, or isn’t sufficiently well fed, may even decide to eat his charges! The working life of a Maremma is less than half that of a llama. Prof. Franklin’s research suggests that 50% of US guard dogs die (due to disease, accident or culling before 3 years of age). Baiting is considered by many to be a two edged sword – get rid of the fox and maybe lose the sheepdog, or the house dog to a fox bait too. Those who lean towards organic farming and permaculture may have environmental concerns about baiting too. Both shooting and baiting require ongoing labour. What do you look for in buying a guardian llama? Obviously a large, alert, athletic llama is an advantage. If you want him to work now a mature llama of 2 years or more has developed a sense of “territory”. Naturally some llamas are more territorial than others. If you want the llama as a guardian next year, you may chose to buy a weanling and put him in with the sheep immediately. It is preferable to castrate males intended for guardian duties as some entire males find their female charges quite enticing and their amorous attentions have been know to injure ewes and their lambs. Llamas are happy to “mind” all sorts of livestock – especially babies. They need no special feed, and for 20+ years fox protection they are both effective and cost effective. It is no surprise that those innovative farmers using llamas for 24 hour fox chasers are delighted with their new “weapon”. The best ideas are often the simplest ones. Llamas eat much the same as sheep, but they also enjoy coarse feed – rushes, brambles etc in their diet. If your sheep don’t require supplementary feeding, neither should your llama. Llamas are very easy on fences – fences that keep sheep in will keep llamas in. Llamas are remarkably hardy, but they do require some maintenance – annual Clostridial disease vaccination (eg 5-in-1 vaccine) and regular drenching. Depending on the type of country, llamas may require the occasional trimming of their toenails (this is an easy task). Llamas don’t suffer from flystrike or footrot, and lice infestation is rare. Most llamas need to be shorn annually or bi-annually by a contract shearer. If you want your llama guardian to do his job well, he must be kept healthy and be shorn and toe trimmed. If you’re interested in learning more about having guardians for your livestock, please give us a ring or come and visit us.